The WaveHopper Lifejacket has been designed by anglers, for anglers. The lightweight design of the WaveHopper Lifejacket ensures freedom of movement, durability and comfort with the latest in safety design. Automatically inflates when submerged or may be inflated by pulling a special rip cord. 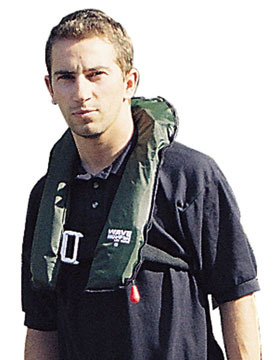 The WaveHopper Lifejacket features integral gas bottle (spares available) and strong, yet easy release buckle. Made from stylish, strong dark green nylon fabric with black webbing straps.